When Tony Stark, a wealthy and amoral arms manufacturer, is captured by terrorists, he makes a suit that will enable his escape. Pepper Potts:"Will that be all Mr. Stark?" Tony Stark (Iron Man):"That will be all Miss Potts." Tony Stark (Iron Man):"Is it better to be feared or respected? And I say, is it too much to ask for both?" Tony Stark (Iron Man):"Let's face it, this is not the worst thing you've caught me doing." Tony Stark (Iron Man):"Find an excuse to let one of these off the chain, and I personally guarantee you the bad guys won't even want to come out of their caves." Tony Stark (Iron Man):"Day 11, Test 37, Configuration 2.0. For lack of a better option, Dummy is still on fire safety. If you douse me again, and I'm not on fire, I'm donating you to a city college." Pepper Potts:"I thought you said you were done making weapons." Tony Stark (Iron Man):"It isn't. This is a flight stabilizer. It's completely harmless." Tony Stark (Iron Man):"I didn't expect that." Tony Stark (Iron Man):"Yeah, I can fly." Tony Stark (Iron Man):"I'm sorry, this is the Fun-Vee. The Hum-Drum-Vee is back there." Tony Stark (Iron Man):"Please, no gang signs. No, throw it up, I'm kidding." Tony Stark (Iron Man):"Your eyes are red. A few tears for your long lost boss?" Pepper Potts:"Tears of joy. I hate job hunting." Tony Stark (Iron Man):"Yeah, vacations over." Tony Stark (Iron Man):"Iron Man? That's kind of catchy. It's got a nice ring to it. I mean it's not technically accurate. The suit is a gold titanium alloy, but its kind of provocative, the imagery anyway." Tony Stark (Iron Man):"I don't want to see this on your Myspace page." Tony Stark (Iron Man):"My turn." Tony Stark (Iron Man):"Oh, yeah, yeah, yeah, the guy from the uh..."
Agent Phil Coulson:"Strategic Homeland Intervention, Enforcement and Logistics Division." Tony Stark (Iron Man):"Phew! God, you need a new name for that." Agent Phil Coulson:"Yeah, I hear that a lot." Col. 'Rhodey' Rhodes:"Next time baby!" Pepper Potts:"I would like a vodka martini please, very dry with olives. A lot of olives. Like at least three olives." Christine Everheart:"You've been called the Da Vinci of our time. What do you say to that?" Tony Stark (Iron Man):"Absolutely ridiculous. I don't paint." Christine Everheart:"And what do you say to your other nickname, the Merchant of Death?" Tony Stark (Iron Man):"That's not bad." Tony Stark (Iron Man):"Yeah peace! I love peace. I'd be out of a job with peace." Tony Stark (Iron Man):"What, you got plans?" Pepper Potts:"As a matter of fact I do." Tony Stark (Iron Man):"I don't like it when you have plans." Pepper Potts:"I'm allowed to have plans on my birthday." Tony Stark (Iron Man):"It's your birthday?" Tony Stark (Iron Man):"I knew that. Already?" Pepper Potts:"Yeah, isn't that strange? It's the same day as last year." Tony Stark (Iron Man):"Well, get yourself something nice from me." Pepper Potts:"Oh it was very nice. Very tasteful. Thank you Mr. Stark." Tony Stark (Iron Man):"You're welcome Miss Potts. Tony Stark (Iron Man):"Let me guess. Berkeley?" Tony Stark (Iron Man):"Well, Miss Brown, it's an imperfect world, but it's the only one we've got. I guarantee you the day weapons are no longer needed to keep the peace, I'll start making bricks and beams for baby hospitals." Tony Stark (Iron Man):"Every night in front of the mirror before bedtime." Christine Everheart:"I can see that." Tony Stark (Iron Man):"I'd like to show you firsthand." Tony Stark (Iron Man):"Sometimes you gotta run before you can walk." Christine Everheart:"You ever lose an hour of sleep your whole life?" Tony Stark (Iron Man):"I'm prepared to lose a few with you." 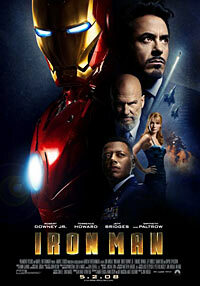 Tony Stark (Iron Man):"I feel like you're driving me to a court martial. This is crazy. What did I do? I feel like you're going to pull over and snuff me. What? You're not allowed to talk?" Tony Stark (Iron Man):"Am I making you uncomfortable?" Pepper Potts:"Oh, no, I always forget to wear deodorant and dance with my boss in front of everyone that I work with in a dress with no back." Tony Stark (Iron Man):"Well, you look great, you smell great. But I could fire you if that would take the edge off." Pepper Potts:"I actually don't think you could tie your shoes without me." Tony Stark (Iron Man):"I'd make it a week." Pepper Potts:"Really? What's your social security number?" Tony Stark (Iron Man):"... five"
Pepper Potts:"Five? Right. You're missing just a couple of digits there." Tony Stark (Iron Man):"The other 8. I've got you for the other eight." Tony Stark (Iron Man):"Peace means having a bigger stick than the other guy." Christine Everheart:"That's a great line coming from the guy selling the sticks." Tony Stark (Iron Man):"It is one thing to question the official story, and another thing entirely to make wild accusations, or insinuate that I'm a superhero. " Christine Everheart:"I never said you were a super hero." Tony Stark (Iron Man):"You didn't? Well, good, because that would be outlandish and, uh, fantastic." Pepper Potts:"I've got your clothes here. They've been dry cleaned and pressed. And there's a car waiting for you outside that will take you anywhere you'd like to go." Christine Everheart:"You must be the famous Pepper Potts." Christine Everheart:"After all these years, Tony still has you picking up the dry cleaning?" Pepper Potts:"I do anything and everything that Mr. Stark requires. Including occasionally taking out the trash. Will that be all?" Soldier:"Sir, I have a question to ask." Tony Stark (Iron Man):"Yes, please." Soldier:"Is it true you went 12 for 12 with last years Maxim cover models?" Tony Stark (Iron Man):"That is an excellent question. Yes and no. March and I had a scheduling conflict but fortunately the Christmas cover was twins." Tony Stark (Iron Man):"They say the best weapon is one you never have to fire. I respectfully disagree. I prefer the weapon you only have to fire once. That's how dad did it, that's how America does it, and it's worked out pretty well so far."